It is common that a NYC homeowner may become aware of a water line leak after noticing water seeping through the roadway, sidewalk or foundation wall of the house. It is also common that a homeowner becomes aware of a leak after receiving notification from the DEP in the form of a three day notice. How do you know if the water leak is from your pipe? If a water leak is showing up in-front of your home, it does not necessarily mean that the water leak is coming from your pipe. When a water line leaks, the water travels until it finds the weakest point in the ground. The water usually finds its way to the surface through a crack in the road, sidewalk or a valve box on the sidewalk. It is possible that a water line leak is coming from a neighboring house and showing up in-front of your house due to cracks in the roadway or sidewalk. How do you determine where the water is coming from? A licensed water main and sewer contractor should perform a sound test on your pipe, which should always be free of charge. The test will assist in determining whether your pipe is leaking or not. The licensed contractor will first turn off the main house control valve to stop all running water throughout the house. At this point, the water line should be completely silent when the contractor performs a sound test using a sonoscope. 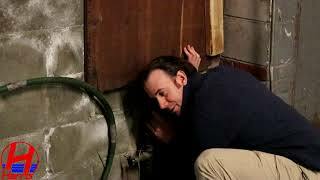 If he hears running water through the sonoscope, there is a good chance that the pipe has a crack resulting in a hissing or rumbling noise. If you feel that the leak is coming from another house, you should call 311 and have the DEP perform a noise test on neighboring houses. How to resolve a leaking water line? 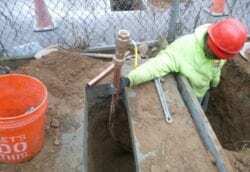 A licensed water main and sewer contractor must obtain permits from DEP and DOT. All permits must be obtained before excavating the roadway to repair or replace the existing water main. 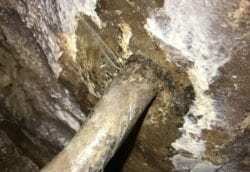 If the existing water line is made of lead, it is illegal to make a repair on the water line. All lead water lines must be replaced in full from the city water main to inside the house. Ductile iron, copper and steel pipes produce louder sounds than a pipe made of PVC, clay or cement pipes. A larger size pipe, regardless of the material, will not produce as loud of a sound as smaller pipes. If the surrounding soil is not compacted well and/or a sand like material, it may not transmit the water leak very well. If the surrounding soil is compacted well and has had time to harden, it will transmit the sound much better. The depth of the water line will have an impact on the sounds as well. The deeper the water line, the harder it is to hear. A 4’ deep leaking water main will be much easier to hear than one that is 8’ deep.